I hope you've enjoyed a lovely weekend! Pleasing to You is having a 100th Post Party and is asking everybody to link up posts about JOY! Since I wrote here about how I want to find JOY to make my home sing, I thought it would be a good post to link up! Go there to read what brings others joy! 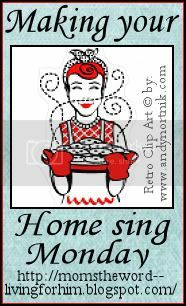 I've been wanting to start working on making my home sing, so this meme is perfect! I plan to take on a new homemaking project each week. I'll post about them on Mondays as part of trying to make my home sing (and maybe even linking to Tackle It Tuesdays at 5M4M). I will take on my first project this week and post about it next Monday. My first project will be making homemade yogurt. I already have the recipe and my hubby is very excited for me to attempt it! I was inspired today to try to focus on JOY when it comes to being a homemaker. I will be honest - I struggle greatly with homemaking. I'm a stay-at-home mom with 1 son who attends a Christian school. I have the time and the ability to take wonderful care of my home and family. I have no excuses. So why oh why do I constantly fall short? I know it is sin in my heart. I believe it is selfishness and rebellion. I want to do what I WANT to do and cleaning floors and washing dishes are not high on that list! And I certainly don't WANT to do something that I'm told I HAVE to do! Sounds childish, doesn't it? I am childish, but I am also a child of God. I was reminded today of just how very blessed we are as children of God! I don't deserve all the things that the Lord has blessed me with, but He has blessed me just the same. I WANT to shift my thinking to consider the things that I have to do as things that I get to do. I WANT to be a blessing to my family. But I can't do that...on my own! I HAVE to ask for God's help. He can help me overcome these struggles and make that shift. He can help me make my home sing! Instead of being a reluctant homemaker, I can be a homemaker filled with JOY! I hope that you'll stay with me on this journey. And I do ask for your prayers in this area my friends. It means so much to me to know that I have your support! Stop by Mom's The Word to see how others are making their home sing! I'll see you back here tomorrow for Tea For Two-sday! Isn't there ALWAYS something we SHOULD be doing? LOL. I'm sure you home sings. But ever home's song is different. Big my song is Girls Just Want To Have Fun size hugs to you! Hi Lisa! I am the same as you and there are always so many other things I want to do instead of what I should be doing! I am not good at keeping my home tidy and clean. It feels like a vicious circle at times. I also need to work on being more joyful about this stuff!! I hear you, girl. I can get very selfish with my time and wanting to do what I want to do, instead of do things to make my home a homey, happier place to be. I am asking the Lord to help me with that, though. I love that you're making homemade yogurt. I have a crockpot recipe for that but have never tried it. Let us know how it turns out. My thing is, it makes so much and I am the only one around here that eats yogurt fairly often, although my oldest son eats it sometimes. Thank you for joining up with us today and looking forward to seeing the rest of your projects (I hope to make homemade laundry soap someday, but still haven't done it yet). Dear, dear Lisa, Don't be so hard on yourself, I know that you are a first rate homemaker,mother and wife. I like the Bless You necklace just like yours, how beautiful...just like you!!! I need help in this area too. Not just the homemaking part, but in being joyful. Looking forward to following you on this journey! WOW...so glad I'm not alone in this :-)I LONG to have a glorious home, clean in every corner, beautifully put together, but time and money prevent me from having the home of my dreams...thankfully I have a hubby who helps me so much with housework...Thanking the Lord for that gift! I feel the same way except I couldn't handle it. I was a stay home mom for about 6 months and needed to be talked off of the ledge everyday. I am a horrid housekeeper and have struggled to understand what is wrong with me. I long to be the Mom with the tea towel perpetually on her shoulder and cookies in the oven. I have been blessed with a part time job at my church to help keep my feet on the ground and my house is better order. I look forward to reading your posts.